As the fleet Jumps toward the Ionian Nebula, a mysterious landmark on the way to Earth, a strange mood settles over its citizens. Roslin dreams vivid dreams, Tigh and Anders inexplicably struggle to hear a static-laced song on the radio, and a few lost souls turn to Gaius Baltar with a devotion that borders on religious worship. Amidst all this, Baltar's trial for treason begins. 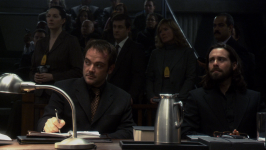 William Adama sits on the judges' tribunal, while his son, Lee, assists attorney Romo Lampkin on Baltar's defense team. Then Racetrack returns from a scouting mission with the chilling news that a Cylon force is secretly pursuing the human fleet. As Adama, Tigh, and Roslin confer about this crisis, Lee notices an apparent triviality: there's something peculiar about the special tea that Roslin is drinking. Tigh interrogates the prisoner Caprica Six about the pursuing Cylons. She confesses that the human fleet's fuel ship emits a quirky radiation signature that the Cylons can track. Oddly, she then torments Tigh with questions about his dead wife, Ellen. Rattled, Tigh shows up drunk for his testimony at the trial. On the witness stand, his inebriation is obvious. Sensing easy prey, Lampkin pounces, his lawyer's intuition leading him to ask how Tigh's wife died. Tigh admits that he himself killed Ellen. His credibility is destroyed. By contrast, Laura Roslin's testimony against Baltar is so damning that Lampkin calls a recess to consult with Lee and his client. They must discredit Roslin. Lee admits that he knows something useful, but he hesitates to enter the moral gray area of exposing a good woman's secret to defend an accused traitor. Then Adama accuses Lee of tipping off Lampkin to the truth about Ellen Tigh's death. Adama is wrong — Lee never even knew Tigh's murderous secret. But when Adama refuses to believe that, father and son explode into anger and Lee resigns his commission. Now a civilian, Lee chooses to conduct Laura Roslin's cross-examination himself. Mercilessly, he extracts her secret: as he noticed earlier, her tea is laced with the herb chamalla, which can cause hallucinations. This casts suspicion on her testimony, and Lee's first dirty job as a defense attorney is done. Roslin, however, adds that she's taking the drug because her cancer has returned. - Romo Lampkin's opening statement. - The Cylons ambushing Racetrack's raptor. - Tigh's scene with Six. - Tigh on the stand. - Adama helping a drunken Tigh get back to his quarters. - Apollo and Adama discussing the Cylon situation then spatting at each other concerning the trial leading to Apollo's resignation. - Lee Adama cross examining Roslin. - Roslin revealing that her cancer has returned. Crossroads, Part 1 reminds me a lot of Lay Down Your Burdens, Part 1 in that it's a very weak opening for a much bigger episode. In fact, the format of the final three episodes of season 3 is identical to that of season 2. Like Downloaded, The Son Also Rises was an unexpected pleasure, the following episode was an unexpected downer, and if the trend continues, Crossroads, Part 2 will be almost as good as The Son Also Rises, but not quite. The way Crossroads, Part 1 is setting it up, I wouldn't be surprised. First and foremost, I'm almost sorry to see the Cylons return as the absurdly vague overarching thematic mysticism surrounding them is returning with them. The subplot with the music that only Tigh, Anders, and Tory seem to be able to hear was simply annoying and for all that I'm immensely glad they're finally getting on with the trial of Baltar, I found the proceedings to be mostly slow, tedious, overly drawn out, and distinctly not dramatic. 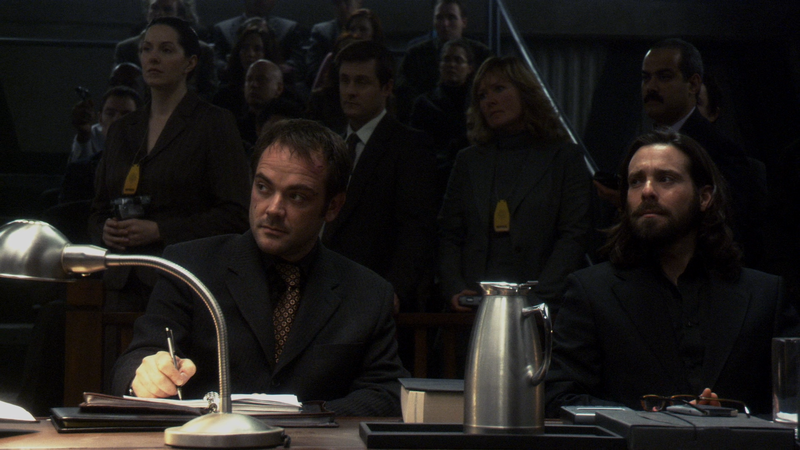 The prosecutor's opening statements were horribly verbose and even Romo Lampkin bored me to tears. What makes the trial so boring is that the characters are discussing at length events the audience is already intimately familiar with. It's almost as if this episode was constructed for an audience that hasn't seen the last three seasons as a way to get them to catch up. In fact, the only aspects of the trial that were interesting at all were in ways that it allowed character development to flourish, such as a drunken Tigh candidly talking about Ellen on the stand and Roslin revealing that her cancer has returned. And even the detail about Roslin's cancer returning seems dubious. Her behavior in this episode has been distinctly out of character, which leads me to wonder if she simply lied about having cancer again. I certainly hope she isn't, because Roslin having cancer again would be an actual interesting arc to explore. But it's treated as a minor detail in this episode. More time was spent on entirely useless scenes, like when the crazy lady with the sick son visits Baltar, or the numerous characters-hearing-inexplicable-music scenes. A better version of this episode would have taken Roslin's cancer and made it the front and center issue. Instead, Roslin walks around with a swagger as if having cancer again is not at all a concern to her. A better episode would have cliffhangered us with Roslin either revealing her cancer to the audience or Doc Cottle revealing to Roslin that she has cancer again, leaving us at the edge of our seats wondering if Roslin's going to live instead of leaving us with the sad excuse for a cliffhanger that was "it's in the frakkin' ship!" In the end, this episode just feels out of focus. Much like Colonial Day, we've got some nice details here like Roslin's cancer (perhaps) returning, Adama continuing to be an angry emotional wreck, along with Tigh's scene with Six, but little details do not an episode make. Beyond those details, this episode much like Colonial Day is straightforward and much like Lay Down Your Burdens, Part 1 presents plot threads in a most underwhelming way that really should have been extremely interesting.